As a Brandeis student, a Princeton history professor learned to think on his feet and stand up for his beliefs. And that, he says, made all the difference. A November 1990 peace demonstration in the Usdan Student Center. The next day, hundreds of students at Brandeis began occupying the Bernstein-Marcus administration building, vowing not to leave until 13 demands for furthering racial equality on campus were met. The protesters called their sit-in “#FordHall2015,” in recognition of the 1969 student takeover of Ford Hall, which protested a lack of minority representation on campus and led to, among other changes, the creation of the university’s African and Afro-American studies department. 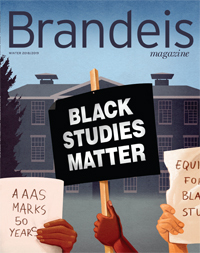 The 2015 Brandeis sit-in ended after 12 days, when Interim President Lisa M. Lynch signed an agreement that reaffirmed the university’s commitment to racial diversity. Similar events have taken place recently at dozens of other schools nationwide, including the University of Missouri, Harvard and Yale. Against the backdrop of this wave of activism, some critics — on both the left and the right — have complained that students are creating a climate of intimidation on campuses and that politics is playing too big a role in their daily lives. I might not agree with everything current students are demanding — and I can see how some pockets of protest might serve to discourage debate — yet I believe it’s vital that we nurture a culture of campus activism. My own Brandeis experience tells me a lot about what’s right with today’s activism. From the moment I arrived on campus as an undergraduate, I began to grow. Students and faculty were challenging their peers on issues around divestment, race, Middle East politics, even food. In the best classes, the stakes of the discussion seemed enormous. We weren’t just learning our lessons. We were debating the world. In the late 1980s, the academic departments at Brandeis radiated intellectual energy. Professors challenged the way students thought and, in the process, strengthened our ability to argue and question in the public sphere. My mentor, intellectual historian James Kloppenberg, showed me that political ideas really mattered. I was riveted as he dissected the political thought of John Locke with the same kind of passion most Americans reserve for their favorite sports team. Exploring the ideological evolution of our country is not some esoteric exercise, I learned, but a way to understand politics today. Historian Morton Keller was a real intellectual pistol, ruthlessly questioning all orthodoxies. Every question can be understood from multiple perspectives, he told us, and it is crucial we never become too comfortable with the status quo. Sociology professor Gordon Fellman, the quintessential Brandeisian, was a product of 1960s activism. Gordie, as he insisted we call him, rejected the militarism I had always heard was an inevitable part of international relations, and believed every citizen must change the world. In his mind, political activism and higher education were intertwined. His courses on international conflict and the Middle East showed me how professors could connect scholarly work to real-world politics. Although Gordie was deeply connected to the left, he insisted that all voices should be heard. Nothing excited him more than to see students taking a deep dive into debates about nuclear weapons, Israel and the Palestinians, or inequality in America. Once, as the newsletter editor for a progressive Jewish organization to which Gordie belonged, I wrote an editorial about American-Israeli relations that broke with the ideas of the organization’s leaders. When I was lambasted for opposing the party line, Gordie adamantly defended me, saying I did the right thing by articulating a position in print and standing by it, regardless of the heat. Looking back, I’m struck by how many of my fellow Brandeis students were engaged in the world around us. I made friends who were loyal, spirited and smart, and we certainly had our share of fun. We also brought our politics to campus. Though I didn’t really appreciate it at the time, I now know how rare this kind of community is. I learned to never stop asking or arguing. The dorms, the dining halls and our senior-year house on Russell Street became ground zero for charged debates about politics, culture and society. Debating was our rock ’n’ roll. Could presidential contender Michael Dukakis prevail when the conservative revolution had shifted debate to the right? What were the implications for a reunited Germany four decades after the Holocaust? Of course, we constantly discussed Israeli-Palestinian relations. The first Palestinian Intifada began in December 1987, during my first year at Brandeis. One of my Israeli friends on campus, a hawk, explained to me the reasons Israelis felt their security was in danger and why a tough response was the only viable option. Another Israeli friend, who would do his military service when he returned, was a dove. In his mind, his fellow citizens were ignoring opportunities to make peace with the Palestinians. Like today, the campus radiated activism — it was at the heart of the Brandeis experience. During my first trip to campus, I saw a shantytown set up by anti-apartheid protesters demanding that university officials divest from South Africa. Through Take Back the Night campaigns, students fought for a world where women could feel safe from sexual aggression. There was a reproductive-rights teach-in, and some of my friends joined hundreds of thousands in Washington, D.C., to march for a woman’s right to choose. When President George H.W. Bush launched Operation Desert Storm, there were vigils, marches and demonstrations supporting and opposing the action. I wrote an Op-Ed in The Justice raising questions about the operation’s rationale and efficacy. Most of the active campus groups were liberal. Yet young Republicans were also making their mark. Nothing was beyond the pale at Brandeis. Students even protested about food and religion. In 1988, President Evelyn Handler allowed the non-kosher dining halls to serve pork and shellfish for the first time in university history, which some students saw as a repudiation of the university’s Jewish roots. A few students set up shanties they called “Pigtown” to make their voices heard. Handler ultimately agreed that pork would be served in one dining hall upon request and that shellfish would not be allowed. One of the most resonant examples of activism centered on race. In February 1990, 30 African-American students launched a boycott of the Barnes & Noble campus bookstore, claiming that two managers were racially profiling African-Americans by following them around the store. The students argued this was a kind of racism too often ignored — not formal segregation or discrimination, but insults hidden within daily interactions. Seven hundred students signed a pledge to boycott the store. It worked. Barnes & Noble announced the managers would be fired despite their denials of wrongdoing. The company promised to institute an improved complaint process, hire more African-American students and implement better training for racial sensitivity. The boycott organizers then called on the university to hire more African-American faculty, make curriculum changes, create an intercultural center, and oppose a proposal to arm campus police (on the grounds that they had a record of harassing African-American men). At Commencement, the Harvard sociologist Daniel Bell told our class, “Wisdom is the tears of experience.” I understand now just how many tears of experience I shed as an undergraduate. My passion for learning and research, my belief in the centrality of debate and deliberation, and my appreciation for the centrality of politics were sculpted by my Brandeis years. Today, when I look at student activism, I instantly see the magic of those years. As campus activism intensifies, I hope we remember how to do it right. Professors should prod students out of their intellectual comfort zone without imposing an agenda of their own. Admissions committees should recruit students who are interested in public life. Students should devote time to activism and political engagement, and build campus groups that support inclusion and diversity (of all kinds, from social to intellectual) without marginalizing any communities. Let’s not be scared of campus protests. Being at Brandeis when the campus was hot was one of the best things that could have happened to me. As someone who teaches and writes about American political history, I am grateful the university changed the way I see the world. Julian E. Zelizer is the Malcolm Stevenson Forbes, Class of 1941 Professor of History and Public Affairs at Princeton University and a fellow at New America. He has written and edited 17 books and more than 500 Op-Eds, and writes a weekly column for CNN.com. His most recent book is “The Fierce Urgency of Now: Lyndon Johnson, Congress and the Battle for the Great Society” (Penguin).